The Department Of The Interior Wants To Limit Public Records Requests Public records requests to the office of the Secretary of the Interior have increased by over 200 percent since 2016. Critics say that proposed rule changes to limit those requests will hamper access. 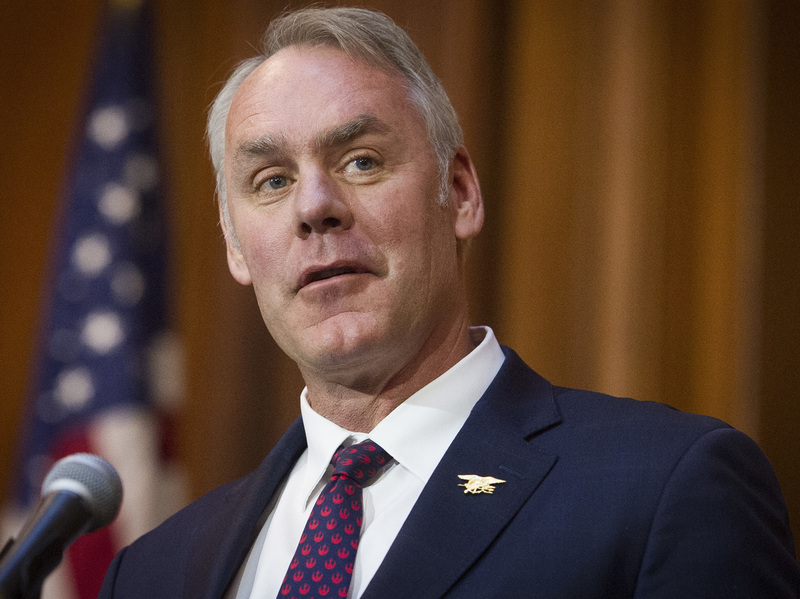 Former Interior Secretary Ryan Zinke left the Trump administration amid unresolved ethics investigations. His department has been inundated by Freedom of Information requests and is now proposing a new rule which critics charge could limit transparency. When Ryan Zinke, a former Navy SEAL, left his post as U.S. Interior Department secretary on Jan. 2, he was under fire on multiple fronts. There was an ongoing federal investigation into Zinke's role in a real estate deal between his family foundation and the head of oil giant Halliburton. Rumors swirled that his office tried to replace the head of Interior's internal watchdog with a Trump political appointee. Some of these investigations came about because of public records requests to Interior from media outlets and environmental protection groups. One frequent requestor was Western Values Project, a non-profit government watchdog group based in Zinke's hometown of Whitefish, Mont. Zinke called out Western Values specifically, criticizing the group during a Fox News interview shortly before he resigned. "They're operatives from the Democratic Party," he said. "They're hacks, they've always been, and they need to be investigated." Now a new rule proposed by Interior in December appears designed to make it harder for groups like Western Values Project to get those public records. The rule would give the agency greater discretion over how it handles public records requests. For instance, the agency would require individuals or organizations to be more specific in which documents they want. It also allows a cap on the number of documents Interior processes for individuals and organizations every month. We file public records requests in order to find out if the people who run the Department of the Interior have conflicts of interests with the companies that they are supposed to regulate. None of which sits well with Chris Saeger, the Western Values Project's executive director. "What they are doing is a very thinly veiled effort to target critics of the Trump administration and to keep their corruption a secret," he said. Western Values is a vocal and persistent critic of the Trump administration. It has filed 152 requests with the Interior Secretary's office since Trump took office. The agency's embrace of industry as part of its pro-energy agenda has, in part, led to a two hundred percent increase in Freedom of Information Act requests to the secretary's office from all kinds of groups and individuals. "We file public records requests in order to find out if the people who run the Department of the Interior have conflicts of interests with the companies that they are supposed to regulate," he said. But the Interior Department argues it's being inundated by complex requests from "litigious special interest groups" asking for thousands of government emails and documents. "They are more voluminous," said Hubbel Relat, counselor to Acting Interior Secretary David Bernhardt. "They've delved a little deeper into the quest for a range of information that appears to, at times, be asking for every document that's ever been created by the Department of the Interior." If the requests aren't responded to within 20 workdays or processed within a timely manner, the Interior Department can be sued. Western Values has filed six lawsuits against Interior in the past two years; at the end of fiscal year 2018, the Interior Department was facing nearly 130 FOIA-related lawsuits. Relat said all this litigation has slowed down the processing of public records requests for everyone else, including those who can't afford to litigate and must wait even longer for a response. "What this [new rule] does is allow us to say, 'OK. We will produce a set number of documents and then we are going to move to the next requester and then and on and on," Relat said. "So everyone gets the same amount of documents and we will return to your request once everybody has had a turn." But media advocates aren't buying it. "The changes are really incredible," said Adam Marshall, a staff attorney with the Reporters Committee For Freedom of the Press. "And not in a good way." His organization has filed comments with Interior on behalf of 39 news organizations – including NPR. It argues the regulations will make it more difficult for the public and the press to know what's going on at Interior. "These are things that affect people in a really tangible way," Marshall said. "Increased public interest should be welcomed by the department. They should be taking steps to make more information available." Marshall argues that the Interior Department should hire more staff to process requests in a timely manner. A 2018 report from the agency's chief FOIA officer blamed the backlog on a hiring freeze and limited staffing, as well as on the big rise in complex requests and subsequent litigation. Press advocates and environmental protection groups aren't the only ones concerned about the Interior Department's new rule. Rep. Raul Grijalva, D-Ariz., the House Natural Resources Committee chairman, has called for an oversight hearing. The new changes have received around 61,000 public comments, including a letter from the Southern Environmental Law Firm representing more than 100 advocacy groups. In the letter, the groups argue the proposed rule is illegal and would "severely undermine government transparency, violate FOIA, and limit important public rights guaranteed by statute."